A major theme in this year’s election cycle, especially on the Democratic side, is the issue of income inequality, especially when measured by the gap between the so-called “rich” and those that are “poor”. 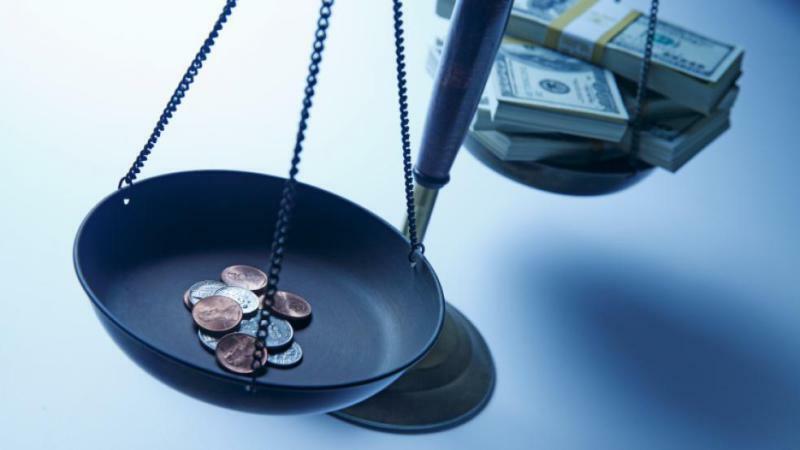 A recent Pew Research Center poll taken in January, 2014 indicates that the issue is also on the mind of voters, 65% said that inequality has increased and 69% favor some form of government action to reduce the income gap. Some amount of income inequality among households is natural as result of individuals making different choices about their education, occupation, and lifestyle choices such as when to marry and how long to stay in the labor force. Inequality also occurs naturally due to age as employees with more experience earn more, in general, than someone with less experience just entering the workforce. There are also other factors that create inequality that are not so natural. These erect roadblocks to opportunity and mobility. Examples include discriminatory hiring practices that limit job choice and educational attainment and government regulations that hamper entrepreneurship. A wide range of income inequality measures have been developed, but a simple way to illustrate it that uses readily available data is by looking at the percentage of households that earn greater than $200,000, the “haves”, and the percentage that earn less than $25,000, the “have-nots”. Using the latest (2014) data from the American Community Survey, the Columbus MSA, consisting of Muscogee, Russell, Harris, Chattahoochee, and Marion counties, had a total of 111,394 total households, 29.4% with incomes below $25,000 and 2.7% above $200,000. While we are unable to judge whether this is good or bad, i.e., whether the inequality is due mostly to natural causes or unnatural forces, we are able to compare Columbus with other metro areas. 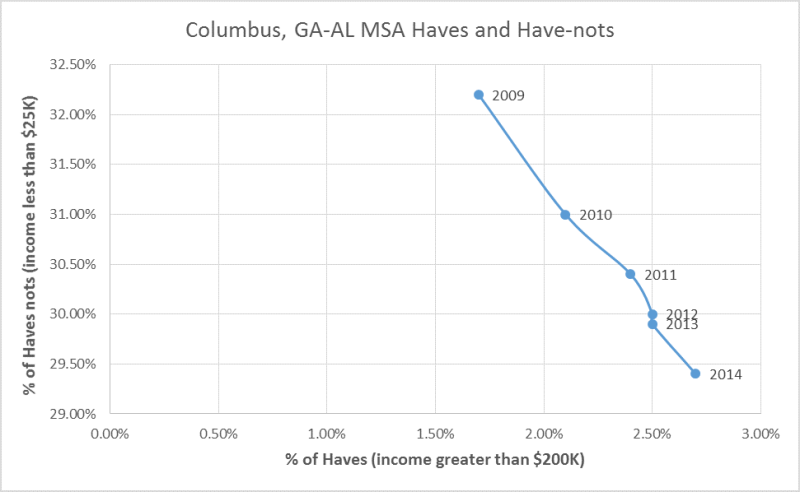 In general, areas which have a smaller percentage of households that are “have-nots” and a greater percentage of households that are “haves” are considered better off than Columbus. This group includes Savannah, Atlanta, and Chattanooga. Those with a larger percentage of “have-nots” and a lower percentage of “haves” are considered worse off. These include Valdosta, Macon, and Tuscaloosa. 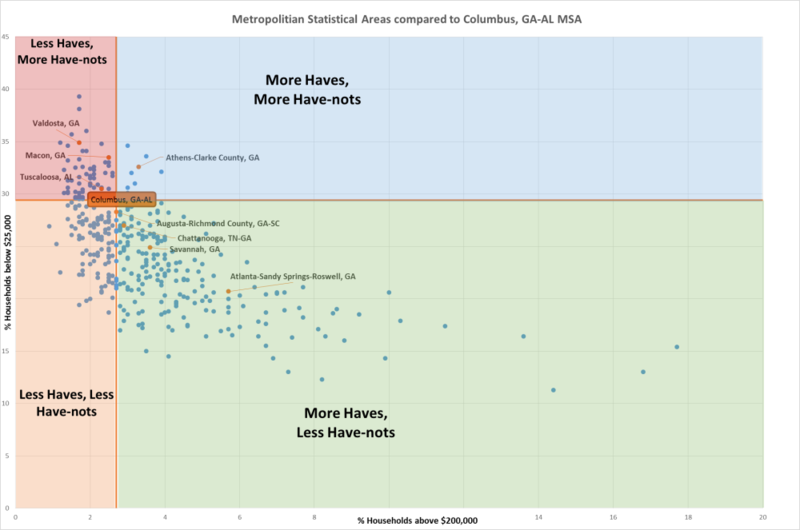 Another group of cities has smaller percentages of both haves and have-nots than Columbus. These areas have a greater concentration of households in the middle-class income categories. Familiar cities in this group include Asheville, NC and Hinesville, GA. Finally, only nine metro areas had a greater concentration of both low income households and high income households. Gainesville, FL and Athens, GA fall in this group. Chart 1 gives us a visualization of these statuses. 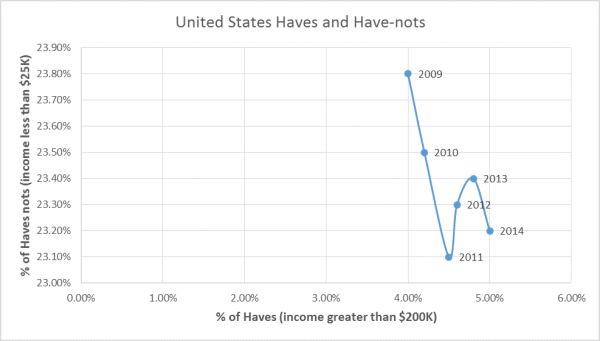 Looking at how the percentage of haves and have-nots has changed over time, sheds some light on the question of whether the rich are getting richer and the poor are getting poorer. The answer depends on where you look, but in Columbus this does not seem to be the case. Since 2009, even though the percentage of high income households has increased, the percentage of low income households has decreased. 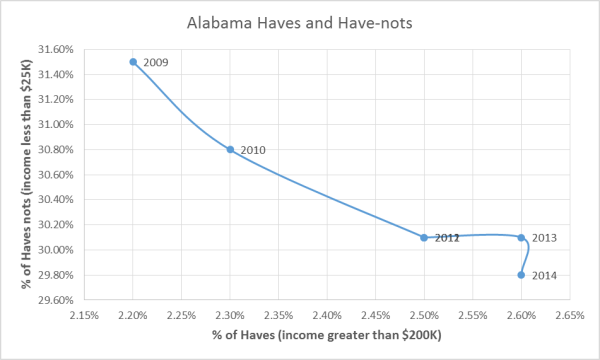 However, statewide both the haves and have-nots have increased. Since 2010, the percentage of households earning more than $200,000 increased from 3.6% to 4.1% while the percentage below $25,000 has also increased from 25.1% to 25.6%. Includes pretax money income of the householder and all other people 15 years and older in the household, whether or not they are related to the householder. Since 2009, the percentage of high income households in Columbus has increased, and the percentage of low income households has decreased. 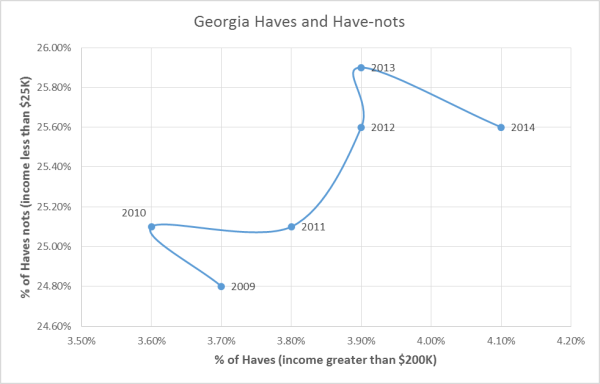 However, statewide (GA) both the haves and have-nots have increased. Since 2010, the statewide percentage of households earning more than $200,000 increased from 3.6% to 4.1% while the percentage below $25,000 has also increased from 25.1% to 25.6%. What seems to matter to voters is not that inequality is present, but the degree of the inequality. As described in the Pew poll, when income disparities are perceived as being too large there is a call for change. As we’ve described here, income disparities differ geographically. So whether income inequality will be a significant factor that decides the outcome of the election will depend on the degree of inequality in the swing states and how each candidate’s policy prescriptions are received by those local voters.